When I watched it a second time, I had the same reactions. I was frustrated, bored and exhilarated in equal measure. Jonathan Glazer had made a film that was as interesting as it was tedious. Yet I returned, then a third time, and when it was over, I could not help but feel that I would, sooner or later, have the urge to watch it again, and again, and again. You see, for as difficult and unconventional as Jonathan Glazer’s film is, there is a hint of sublimity scattered throughout that is inescapable and undeniable. 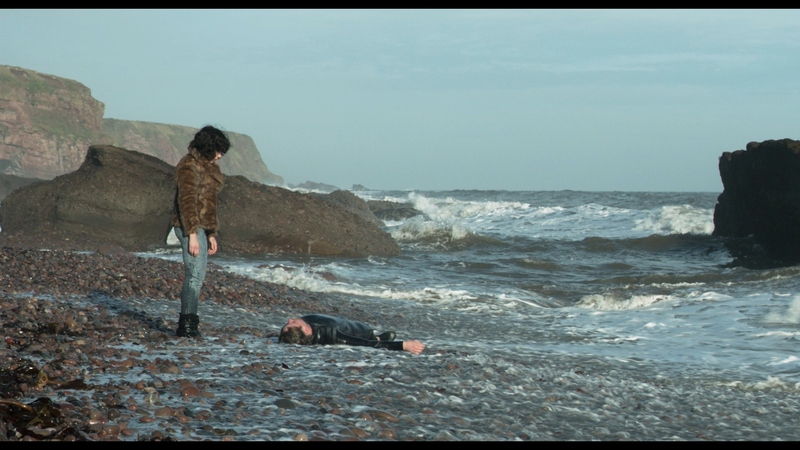 Under the Skin is at its best when it is scarier and stranger, when the things we see cannot be explained and they defy our expectations; or when the atmospheric soundtrack of Mica Levi overwhelms our senses, making us uncomfortable and anxious. At times, what was shown did not seem to belong to a live-action film. Instead, it felt like a bizarre anime, where it is perfectly okay to expect innocent men to walk into their deaths by drowning into pools of black goo, and then turned into flaccid semisolid accumulations of skin and organs. When has a film delivered such emphatic statements of horror with such patience? Under the Skin is filled with great moments that haunt me to this day. However, there is an incredible sequence that deserves a special mention. It takes place at a beach. The sea is angry, the waves pounce against the coast while our alien is still, looking out towards the water wearing a fur coat and tight jeans. A man in a full-body swimsuit slowly approaches her, but as he does, the camera seems distracted, turning away to a family in the distance. There seems to be a problem brewing, but we hope nothing is wrong. Glazer then takes us back to Scarlett, yet our minds wander off. Why were we shown the family in the distance? Why is their dog swimming so far out into the ocean? Is he going to drown? The thoughts come one after another, yet Glazer chooses to stay with the brief exchange between the alluring alien and her naïve prey. It does not last long of course. A few seconds pass by and the camera turns as we hear screaming. A woman is now in the treacherous water trying to rescue her dog. The man that was speaking to Scarlett has now made a run towards them. Tragedy is indeed in the cards. Our alien remains static, as if she does not understand the implications of what is happening, except that death is looming. She observes as a heartless creep would, almost fascinated by what is taking place. She is not necessarily portrayed as evil, but rather as an alien with a mission that does not know what else to do or how to respond. And so, one by one, the dog, the woman, and who I believed was her husband dive into the ominous ocean. Behind, on a towel, a baby boy is left crying. The man that was speaking to Scarlett attempts to save the desperate husband, and he manages to bring him to safety, but there is no stopping a loving husband trying to save his wife. Immediately he gets back to the waters while the swimmer remains face down, totally spent after his tremendous effort, unaware of the danger that lurks. Once the tragedy is set in motion, Scarlett makes her way to the man. She struggles a bit as the waves crash against her. The darkness of her hair in perfect contrast with the bright red of her lipstick. She seems oblivious of everything around her but the man laying flat against the rocky shore. For a couple of seconds she searches for a stone and we know what she will do. After hitting the man on the head, she drags him across the beach but, as she does, we see the baby waling in the background with such desperation and fear that it becomes impossible to separate reality from fiction. Incredibly, Scarlett leaves the baby to his own accord and so does the film. Not only have his parents drowned, but he is now alone, crying and probably cold, waiting for a brutal death. This a moment that comes early on in the film and it is utterly impossible to shake of. As if it was nothing, we hear the news in the radio while Scarlett drives a truck through the countryside. A family drowned and a baby is missing, yet our alien is too busy trying to find other men to take into her evil den. Rarely have I seen such tragedy shown so unmercifully before. What was a happy family picnic turned into the kind of gruesome and haunting moment of existentialism that is bound to capture the attention of local media. An astounding cinematic moment that left me speechless. I stumbled onto this film just after watching Ghost In A Shell, which was kinda weird itself, but not nearly as much as Under The Skin. I couldn’t get over how unbelievably horrible I felt seeing that poor baby crying so desperately for his parents. Momentarily forgetting myself, I began making plans to board a plane to Ireland to take him into my arms. I still hurt for him. Wait, this was a movie, right? Didn’t matter! I still want to save that baby! The scene is certainly shocking, but I highlight it because of how smartly and beautifully executed it was. A criminally under-seen film that deserves a bigger audience.